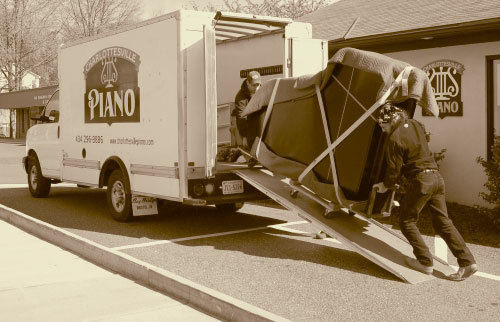 Charlottesville Piano Company will move your piano using only experienced piano movers and time-honored methods and equipment (after all, we’ve been at this for over 112 years!). Rest assured, your piano is safe with us, and we are fully insured. We can move your piano anywhere in the world! We move pianos locally and regionally using our own truck and our own professional moving staff. Our territory goes from New York City south to Charleston, SC, and west to Lexington, KY. For moves outside our region, we use our store as a pick-up or delivery point for cross-country movers that specialize in pianos only. (To expedite your piano move quote, click here) This is easy! Our low-priced local rates apply to the Northern Virginia and DC Metro area, as well as the Richmond Virginia area and Charlottesville. The base price of moving an upright or vertical piano (spinet, console, or studio), is $295. We charge $50 for each flight of 6 or more steps, and $50 to carry a piano across grass, gravel, or other non-paved terrain. If an additional mover is required for a difficult move, $100 is added. Mileage is additional at $1 per mile round-trip beyond a 25 mile radius of Charlottesville, Virginia, Richmond, or the Northern Virginia/DC area. To determine your mileage, go to http://www.mapquest.com. The base price of moving a grand piano is $395 locally and $395 in the DC Metro area. The additional costs explained above, apply. Long distance moves of 4 hours or more with 2 movers is billed at $120/hr. See Mapquest for billable hours adding 1 hour at each location for packing and unpacking. Example: Your grand piano is being moved locally in Richmond, Charlottesville, or Northern Virginia DC Metro area. There are 6 porch steps at one location. For local moves, usually three days notice is sufficient. For regional moves, please book your move at least one week in advance. Please call us at 434-296-8886 for an official quote and availability. For cross-country moves and other moves out of our region, please call for a quotation.